When it comes to creating a beautiful kitchen there are quite a few aspects and details to consider. In addition to making decisions about all the many surfaces in your kitchen it’s also important to think about how these different surfaces will work with each other to create the overall look of your kitchen. Making sure that your countertops and kitchen cabinet doors coordinate is essential when it comes to achieving a perfectly meshed look. Granite countertops are currently quite popular and one of the most requested types of countertops available. It is a natural material that is available in an endless array of colors, patterns, and textures and as a result can be a challenge to coordinate with cabinets. Here are a few tips for coordinating your new granite countertops with your kitchen cabinet doors. If you haven’t already, choose your kitchen cabinet color. If you’re refinishing kitchen cabinets or refacing cabinets that you already have, then you’ll also need to choose how you’ll be finishing your cabinets. By choosing your cabinet color or finish first, then choosing a coordinating type and color of granite will be much easier. Do your research. There are many different types of granite that have varying hardness, texture, color, etc. Also keep in mind how much upkeep you’re willing to put into your new counters as this can help you make your decision. Also consider your lifestyle when choosing your granite counters. If you have children and are prone to a messy kitchen, buy a granite counter that does not stain easily. Create a kitchen color scheme. Granite colors are an important focal point of your kitchen so the color you choose can make a big difference. 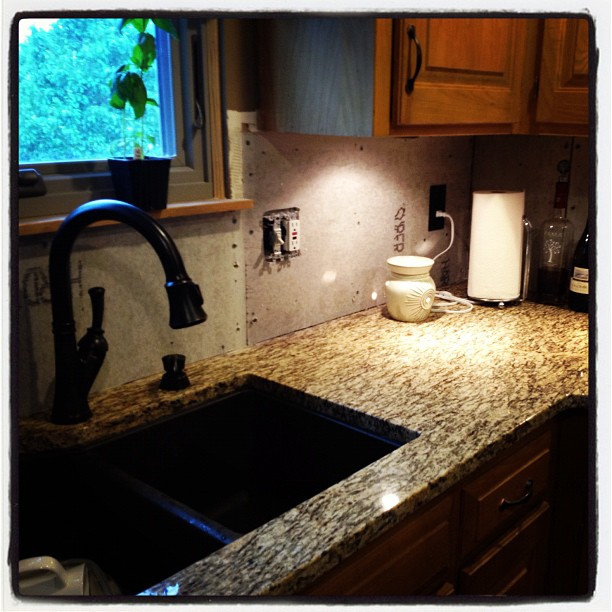 A light granite countertop can brighten up a dark kitchen and vice versa. If you like to change up the look of your kitchen on occasion, go for a granite counter that is neutral and may coordinate with an array of kitchen cabinet colors. Go shopping. There’s no better way to get a sense of the color and texture that you like than by browsing samples in a store. If at all possible, take a cabinetry sample to compare to the granite at the store. Try to see if you can compare in sunlight and artificial light both. By keeping these simple tips in mind you should be able to find a granite counter that coordinates beautifully with whatever type of cabinets that you have, creating the kitchen of your dreams.